The inspiration for this dish is the fantastically flavoured Bagara Baingan, a staple of Hyderabadi cuisine. 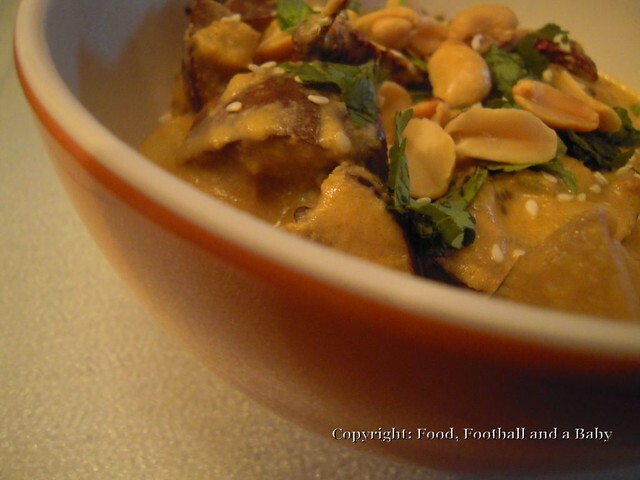 There aren't a huge number of Indian dishes that use peanut sauce as a base, but this is one of them. Along with sesame seeds (til), this dish is just an amazing combination of sweet, salty, tangy and nutty, with a mild flavour of spice coming through. Putting it simply, a healthy, delicious and perfect vegetarian/ vegan dish for a family weekday supper. 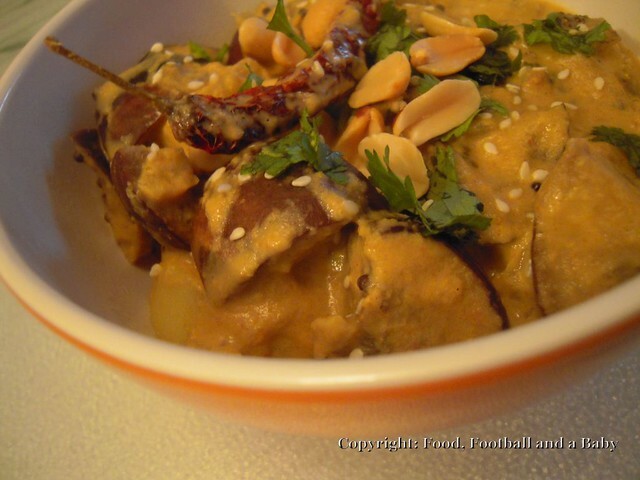 You can make this recipe with aubergine and potato, like I have, or with any other vegetables that need using up. 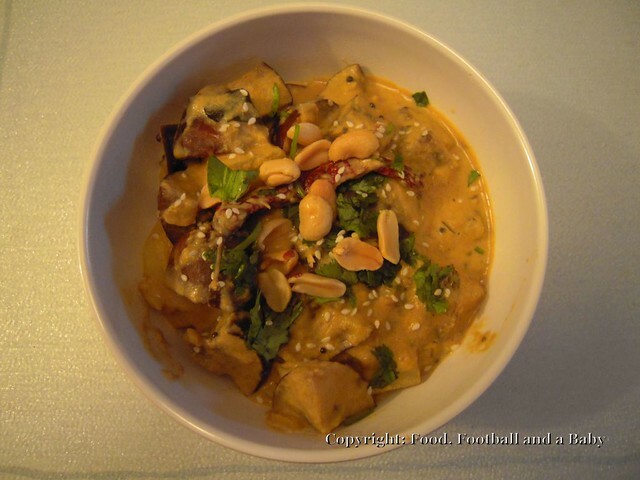 I have also played around a bit with the spicing and the garnishings, but the key elements in this sauce are sesame seeds and peanuts. The sauce alone is beautifully subtle and would also be perfect with paneer. This dish is the perfect make-ahead dish, as the flavours really develop and come together if you serve it the day after it's cooked. Just reheat gently, tossing in the garnishings at the end. In a hot heavy pan, toss together the coriander seeds, cumin seeds, red chillies, peanuts and sesame seeds for around 2 minutes, stirring constantly until the spices start to smell fragrant. Transfer to a powerful blender. In the same pan, throw in the 1/2 chopped onion, ginger and garlic, and cook for around 2 minutes or so without oil, until the raw smell of the onion disappears. Transfer to the same blender as the spices. Using around 1/2 cup of water, grind the above ingredients to a smooth paste. Clean the blender/ mixie with around 1/2 cup water, and keep this water aside. In a saute pan, add 1 tbsp oil, and cook the remaining 1/2 diced onion for 3 to 4 minutes, until light brown. Add the masala from the blender and fry for about 4 minutes or so, until the masala starts coming together into a sticky mass. Now add the cleaning water, tamarind and lemon juice. Stir it all in, then season to taste. If the sauce is too thick, thin it with a little hot water. Meanwhile, fry the cubed aubergines in a little oil, until cooked and tender. Alternatively, you could roast it in an oven for about 30 minutes till they're cooked. Boil the cubed potatoes till tender and keep aside. When you have the sauce at the consistency of double cream, stir in the aubergine and potatoes and cook on a low heat for another 10 - 15 minutes to let the flavour of the sauce infuse into the vegetables. 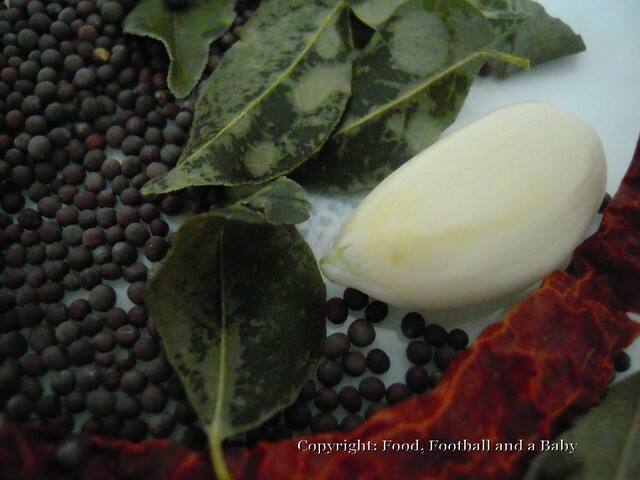 To make the tempering, heat another tbsp oil in a small pan, and when the oil is hot add the mustard seeds, curry leaves, garlic and red chilly, frying for about 30 seconds until the seeds start spluttering. Pour the seasoning into the curry and stir. Garnish with the fresh coriander and toasted sesame and peanuts. Just before starting the endless succession of today's phonecalls - now with added rumbling tum! Seriously seriously good looking and sounding food; like so many of your recipés I'll probably end up nicking some ideas from it!